Dolphins executive Jason Jenkins (center) greets members of NOBLE at Sunday’s Football Unites Tailgate. Two hours before the Miami Dolphins kicked off the 2018 season on the field, the organization proudly launched the third year of its Football Unites Tailgate – a Stephen Ross-led initiative aimed to fortify relationships between local community leaders, youth and law enforcement – outside the Hard Rock Stadium gates. Hip-hop music blared through the speakers as a throng of young fans skipped their way past the Joe Robbie Statue, around a decorative white picket fence and inside a reserved section at the North East Plaza. With a backdrop of colorful murals overlooking the festivities, early attendees lined up for lunch at the hot meal stations before spinning the knobs at an oversized Dolphins-themed foosball table. Each year, the camaraderie, food and entertainment have brought together diverse groups to the pre-game celebrations, which also provide educational components intended to spark conversation and build positive relationships between fans of different races, genders, sexual orientation and identities. Over a dozen organizations have partnered with the Dolphins, including 5,000 Role Models, North Miami Beach Police Athletic League, Urban League of Broward and NOBLE, whose leaders have recognized the program’s immense impact on their community. 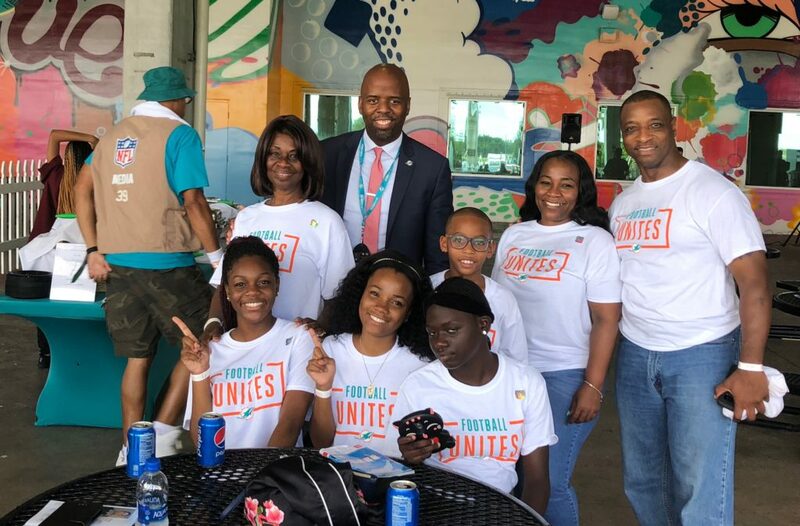 The tailgate is one of a handful of initiatives that culminated from a 2016 town hall co-hosted by the Dolphins and R.I.S.E., during which players – lead by Kenny Stills, Michael Thomas, Arian Foster and Jelani Jenkins – and local leaders addressed ways to combat issues of racial inequality and community discord. At the suggestion of law enforcement officials, Dolphins players – most recently, Davon Godchaux and Kenyan Drake – have participated in ride-alongs throughout the community with local officers as a sign of unity. In addition, the Dolphins have arranged cultural tours and created scholarship programs, while continuing to welcome organizations championing human rights and community justice each gameday. By the middle of the third quarter of Sunday’s game, MetLife Stadium was half-empty, as thousands of dejected Jets fans filed for the exits. By the the time the fourth quarter started and the Dolphins held a comfortable 20-3 lead, Sections 322 and 323 — along with several hundred aqua-and-orange-clad fans scattered around the stadium — were the only ones left clapping in the stands. 760 DolfansNYC members, plus a few more who migrated to join us, cheered for every first down, sang the fight song after every touchdown (even one that was ultimately called back) and made sure to let the Jets know #MetLifeTakeover was in full effect. 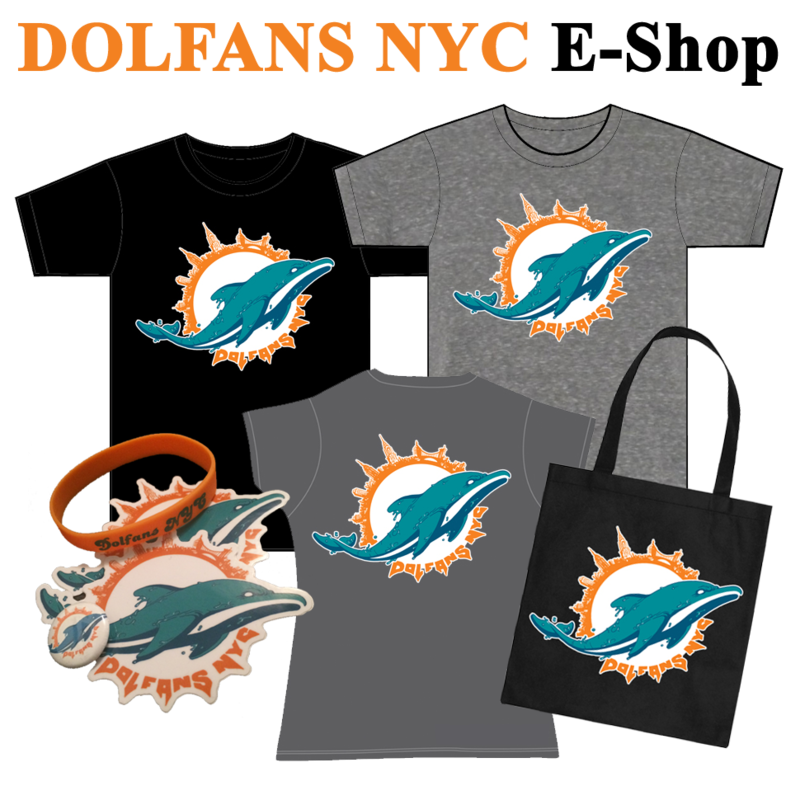 Prior to and especially following the game — along with the support of thousands of fans across the country — dozens of past and present Dolphins stars, front office personnel and media members offered humbling shoutouts to DolfansNYC. Check out notable Tweets and images from CEO Tom Garfinkel, team legend O.J. McDuffie and current players including Brian Hartline, Jared Odrick and Mike Pouncey — all of whom heard their fans loud and clear.